SCM actively collaborates with academics and industry in several EU projects. As an SME, we are happy to discuss whether we can join your H2020 proposal with a scientific software developer to leverage new computational methodologies to a higher technology-readiness level. Just mail our scientific partner manager Sergio López-López, or give us a call to discuss mutually beneficial collaborations. 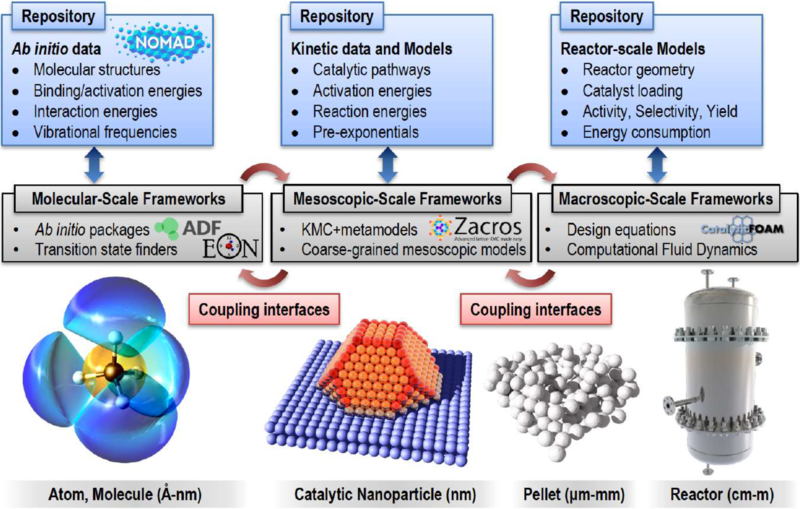 SCM is proud to lead the ambitious ReaxPro project to integrate atomistic, mesoscale, and macroscale modeling tools in a comprehensive multi-scale reactor modeling platform to aid BASF, Shell, DowDuPont & Johnson Matthey to optimize their catalytic reactors. Machine Learning applied to Reactivity. Marie Curie fellow Matti Hellström will improve the accuracy and automated ReaxFF parameterization with machine learning. Automatic generation of Chemical Models is a joint research and training project (European Industrial Doctorate) coordinated by SCM, with Ghent University and RWTH Aachen University. AutoCheMo will develop new and improved tools for modeling chemical processes in industrial reactors. The Science4CleanEnergy multi-disciplinary consortium which will further advance carbon-capture storage technology. At SCM we will focus on further developing ReaxFF -including acceleration and parameterization- to model such complex processes as CO2 storage in clay materials. SCM has led, and participated in, various EU projects including private-public partnerships, initial training networks, and SME innovation associates. Thanks to these projects we have strongly expanded the capabilities of the Amsterdam Modeling Suite enabling more applications in chemistry & materials research. For example, to investigate how geometry defects affect 2D semiconductors, which MOF is the best for hydrogen storage, the best future battery and photovoltaic materials or the best solvent mixture for dissolving polymers. Besides our regular academic collaborations and EU projects, we also participate in NWO-funded local collaborative projects. Reach out to us if you want to discuss collaboration options!